Pútin's performance assumed shades of "grand finale"
New generation intercontinental ballistic missiles powered by nuclear power, of unlimited scope and capable of circumventing all existing defense systems; remote atomic mini-submarines equipped with multiple nuclear warheads; cannons and laser-guided ultra-precision launchers ... 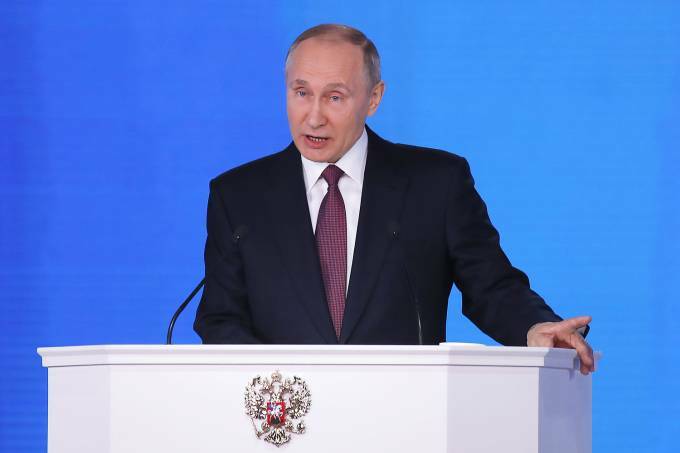 This is, in short, the panoply of new strategic weapons presented by Russian President Vladimir Putin on Friday in Moscow. Illustrated with videos projected on a giant screen, mixing real images with "star wars" computer montages, Pútin's performance assumed "grand finale" tones at the end of a generally lukewarm and less than stimulating speech about the state of the Federation. The Russian leader justified the rearmament of the Kremlin as a consequence, in the long term, of the US withdrawal of the anti-ballistic missile treaty ABM - a key agreement on arms control signed in 1972. Soon after, Russia withdrew of START II, 1993, opening the way for the development of new weapon systems. The agreement of the 70s, kind of nuclear Tordesillas, guaranteed security based on the principle of mutual destruction assured - MAD, in acronym in English. Once this barrier was over, evolution was predictable - each side started to try to obtain weapons capable of overcoming the other's defense systems, in order to impose their will by coercion. What Putin has now come to say - in clear response to the Pentagon's new plans - is that American efforts to that end have not worked, and that Russia is in a position to counter them. In the 16th century, Tsar Teodoro I, the son of Ivan the Terrible, had a giant cannon made to defend the Kremlin, where it is still a tourist attraction - it weighs 400 tons and could theoretically shoot 800 kg bullets! Except for a first test, it never came into operation in combat, but its mere exposure would have had relevant deterrent effects. Puttin seems to want to return to this tradition with the same goal. But now the danger is much greater: it may be the survival of the planet itself. It remains to be expected that the presentation of the new Tsar's cannons could serve as a universal warning for the need to resume the dialogue on nuclear weapons control and reduction. Before it's too late.